This volume is based on an international colloquium held in the University of Zaragoza (Spain) in Autumn 2012 on ‘Urban and Rural Landscapes between Late Antiquity and the Middle Ages’. The scholars gathered at Zaragoza debated many key aspects of the much debated process of the late Roman to early medieval transition, in particular: the influence and impact of Christianity on town and landscape; economic and military decline; cities and their socio-political role as unifying elements for territories (or provinces and kingdoms); the evolving urban form; the continuation or loss of rural villae; and changes in agricultural organization. A further area of discussion was on trade for towns and the landscape, with an emphasis placed on the evidence for the role (and nature) of ports. 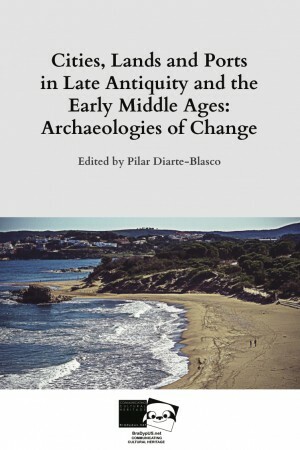 This volume — Cities, Lands and Ports in Late Antiquity and the Early Middle Ages: Archaeologies of Change — contains a selection of fourteen studies from the colloquium which analyze townscape and landscape transformations within the Mediterranean world, from the Iberian and Italian peninsulas, to the Atlantic, Central Europe and the Balkans. This geographical mix is important in providing a suitably wide, but culturally connected, context for the fuller understanding of this crucial transitional period in Europe, en route highlighting the crucial role played – and to be played – by archaeological investigation. With contributes from: Ricard Andreu Expósito, Chantal Bielmann, Felipe Cerezo Andreo, Neil Christie, Pilar Diarte-Blasco, David Fernández Abella, Jaime Gutiérrez Pérez, Alessandro Luciano, Nikolina Maraković, Oriol Olesti Vila, Luis-Gethsemaní Pérez-Aguilar, Arnau Perich, Sebastián F. Ramallo Asensio, Manuel D. Ruiz Bueno, Tin Turković, Isabel Sánchez Ramos, Jaime Vizcaino Sánchez, Maja Zeman. In autumn 2012, an international colloquium called Urban and Rural Landscapes between Late Antiquity and the Middle Ages was held in the University of Zaragoza (Spain) and “Cities, Lands and Ports in Late Antiquity and the Early Middle Ages: Archaeologies of Change” publishes the proceedings of this conference.